Twelve years ago in 1996, Norwegian ambient composer Hærleif Langås embarked upon a new and exciting chapter in his career when he began to explore and experiment with drones, field recordings, samples and minimalistic melodic elements which he used to create soundscapes that had been inspired and influenced by norse nature and landscapes. Little did Hærleif Langås realise that this initial project was the start of a twenty-two year journey, which would transform his career and see him create atmospheric, ethereal, melancholy and minimalistic music which was cinematic and rich in imagery. This music Hærleif Langås released as The Human Voice, Therradaemon and Northaunt, which has been his most successful project. 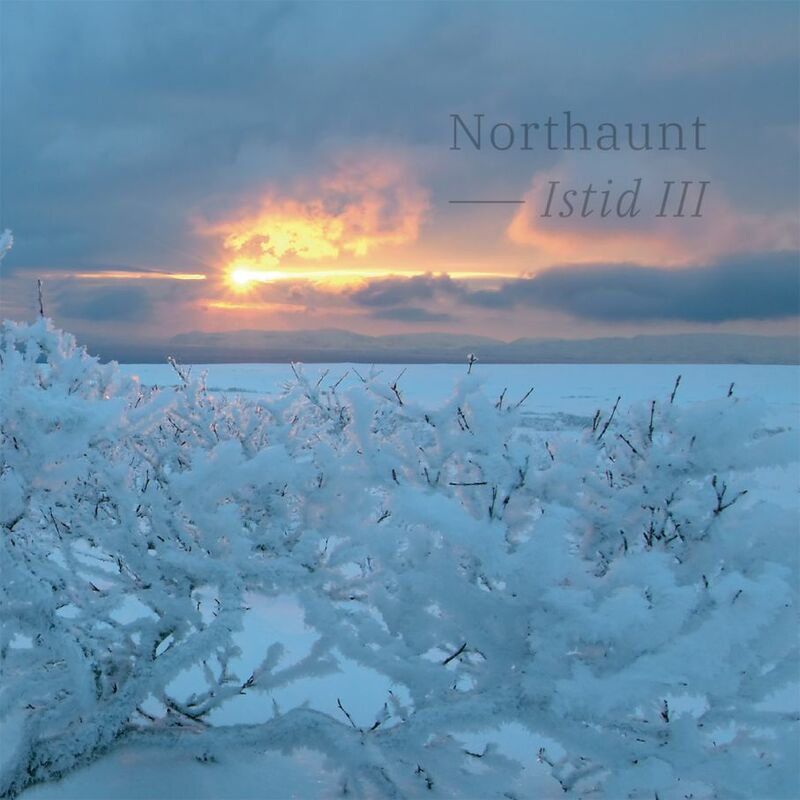 Recently, Northaunt returned with a new album Istid III which was released by Glacial Movements, and is the third album in the series. It’s the latest album in a long line of carefully crafted albums from Northaunt whose career began twenty years ago. After embarking upon this new chapter in his career, Northaunt began work in his home studio where he explored and experimented musically, seeing what worked and what didn’t work. He used ambient, nature sounds, keyboards and an acoustic guitar to create the recordings that eventually became Når landet ligger øde. It wasn’t released commercially or used as a demo. Instead, Northaunt had some CDRs made and created the cover himself and handed out a few copies of Når landet ligger øde to friends in 1998.This was the start of Northaunt’s career. A year later, in 1999, Northaunt had recorded The Ominous Silence which was professionally produced promo. It featured six of the eight songs that would eventually feature on Northaunt’s debut album. Just under two years later, and The Ominous Silence album was released by Fluttering Dragon Records in January 2001. It was a tantalising taste of what Northaunt was capable of. Northaunt returned in April 2004 with his much-anticipated sophomore album Barren Land. It had been recorded between 2001 and April 2003 and was released on Fluttering Dragon Records. By then, Northaunt’s sound was starting to evolve. When Northaunt released his third album Horizons on the Cyclic Law Records in 2006, it was hailed as his finest moment. It had been recorded between 2003 and 2005 and was a carefully crafted album where drones and field recordings were used to create dark and desolate soundscapes that would become Northaunt’s trademark sound. Following the release of Horizons, nothing was heard of Northaunt for seven years. During that period, Hærleif Langås was working on different projects and released albums as Non Ethos, The Human Voice and Therradaemon. Then in 2013, Northaunt and Svartsinn released the split album The Borrowed World, which featured his twenty-two minute epic If Only My Heart Were Stone. Northaunt was back. The comeback was complete in January 2015 when Northaunt returned with in January 2015 with his first solo album in nearly eight years, Istid I-II, which was released on Cyclic Law Records. It featured a collection of minimalistic soundscapes that were atmospheric, ethereal, haunting and melancholy music that was cinematic and rich in imagery. Northaunt takes the listener to the barren landscapes with his soundscapes that ranged from a dark and almost desolate, to a much brighter hopeful ambient sound. Istid I-II was the finest album of Northaunt’s career, and the soundscapes showed the two sides to sides to his music. In 2017, Northaunt was back with his latest album Night Paths, which was an album of dark ambient music. This was similar to some of the music on Istid I-II, and also reinforced that Northaunt was one of the finest purveyors of ambient music in Europe. Meanwhile, Northaunt had a dilemma when he got the chance to release an album on the Glacial Movements label. He had always wanted to release an album on the label that specialised in releasing arctic themed ambient music. This wasn’t the only reason. Glacial Movements was also a label whose progress Northaunt had followed with interest since he featured on one of their early samplers. So when the chance came to release an album on Glacial Movements, Northaunt decided to revive the Istid series. This was something that Northaunt hadn’t planned to do. Instead, Northaunt thought that Istid was part of his musical past. That was ironic given Istid I-II was Northaunt’s finest album, and looked like it was the start of something, rather than the end of it. Thankfully, Northaunt had a change of heart after getting the chance to release an album on Glacial Movements. That album became Istid III. Northaunt was inspired to write Istid III as a reaction to modern life, and how the world can sometimes seem confusing, stressful and noisy. This is very different to the books that Northaunt had been reading about the earth’s history, and especially the Ice Age. He read how about the forces that formed and gave birth to the modern world. Back then, when the modern world was in its infancy and before man walked upon the earth there was silence. However, this all changed when man first inhabited the earth. Northaunt decided to imagine man setting out on a lonely journey where he’s trying to make sense of the world around him, as he begins a searches for meaning in the world before there was even the merest hint of modern life. During the making of Istid I-II, Northaunt had to ask himself what was the world like during this time? While the earth was most likely a dark and desolate place, Northaunt views the desolation as something that is “pleasant” in his mind, and believes the world wasn’t as “dark” many people believe despite being almost devoid of people. This is reflected in the music on Istid III. Istid III opens with Istid III, Pt. I which meander along showcasing a dreamy, ruminative sound that allows the listener to reflect on what the world was like in the early days. Straight away, it has Northaunt’s name written allow over this minimalist soundscape where drones, field recordings, samples and minimalistic melodic elements are carefully combines to create the atmospheric and cinematic music. It’s rich in imagery as gusts of northern winds blow and snow hissing are amongst the myriad of disparate sounds flit in and out, constantly painting pictures in the mind’s eye. Meanwhile, waves of beautiful, ethereal music ebb and flow hypnotically, washing over the listener during Istid III, Pt. II which is a fusion of ambient, drone music and modern classical. Beauty is omnipresent throughout this enchanting track which perfectly depicts the barren and spartan Nordic landscape.It’s possible to imagine making his first tentative steps across tundra and just like the listener to Istid III, Pt II, being smitten by its breathtaking beauty. Gradually, Istid III Pt II reveals its secrets and this understated soundscape features Northaunt at his most melodic and cinematic. He uses an array of field recordings and samples while playing a haunting and melancholy melody on a keyboard. Although there’s a sadness and even sense of melancholy to the music, there’s also a beauty as Northaunt’s use of samples and field recordings results in a soundscape that sets the imagination racing. Istid III, Pt IV is a ten minute epic which features Northaunt at his cinematic best, as snail-like synths sweep and paint atmospheric pictures of the beautiful barren Nordic landscape just after the Ice Age. Meanwhile, the wind gusts and blow eddies of snow which swirl as water drips and gurgles before. Then Northaunt bowls a curveball as the sound of man discovering this new, beautiful and barren landscape can be heard as the track draws to close. It’s as if everything has been building towards Istid III, Pt V, as the drama and tension builds, on a track that is once again atmospheric and cinematic as it meanders along revealing its secrets and subtleties. Gusts of wind blow, while keyboards contribute a melody and reverberate, as Northaunt continues to paint pictures during this hauntingly beautiful soundscape which brings the journey that is Istid III to an end. The best way to describe Istid III, which was recently released by Glacial Movements is a cerebral and thought-provoking album that features atmospheric and cinematic music that is rich in imagery. So much so, that Northaunt takes the listener on a journey that seems very real, and they walk shoulder to shoulder with the first men who set foot on this beautiful, barren Nordic landscape just after The Ice Age. Not many albums have been able to paint pictures as vivid as this, but Northaunt does on Istid III the latest instalment in the Istid series. Istid III is a captivating and enchanting album that is beautiful, dreamy and ethereal but also sometimes haunting, and tinged with sadness and melancholy. Sometimes, there’s a mesmeric quality to the music on Istid III as it washes over the listener and makes the world seem a better place as Northaunt combines elements of ambient, avant-garde, drone music, modern classical and musique concrete. In doing so, Northaunt makes the album that everyone knew he was capable of making after Istid I-II. Three years later, and Northaunt returns with a cerebral and thought-provoking genre classic, Istid III, which is a poignant and powerful career-defining album that is atmospheric, cinematic and rich in imagery, which is what critics and record buyers have come to expect from of one finest purveyors of ambient music. ← SOUTHERN GROOVE: HOTATLANTA, AWARE AND CLINTONE FUNK AND SOUL.